Easter – the time to over indulge on mounds of chocolate and enjoy the End of term Holidays… looking out of my window at the falling snow, we could even be due a white Easter at this rate! It is nice to get out there and spoil children by spending oodles of money on days out and meals out, but sometimes, having a PJ day and chilling in your own domain, snuggled up watching films is just what everyone needs! Luckily there are two cracking new kids film releases on DVD this month to help make a PJ day even more egg-cellent… and you could win the latest releases on DVD in the new Sim’s Life giveaway too! 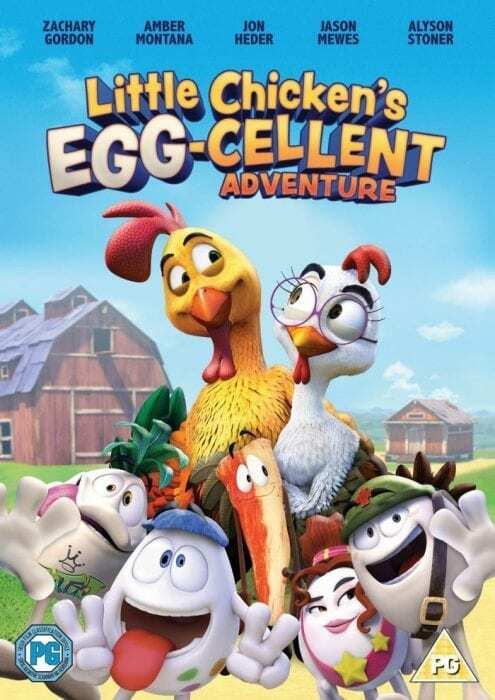 Little Chicken’s Egg-Cellent Adventure (RRP £9.99 Rated PG) due for release on Monday 7th March, features Rolo the teenage Rooster who saves the day against an evil rancher who comes along to threaten Rolo’s home and family. A fun and colourful animated adventure that will delight the whole family. Beyond Beyond (RRP £9.99 Rated PG) due for release on Monday 21st March, follows Johan the seafaring rabbit who sets off on an adventure to a mystical land. Based on a Scandinavian folk tale, Beyond Beyond touches on children reaching the impossible and dealing with the absence of a loved one. Sim’s Life is giving two readers the opportunity to win both DVD’s to enjoy over the Easter holidays. All you need to do to enter the giveaway is use the Gleam entry form below! Good luck to all those who enter! Giveaway ends at midnight Sunday 20th March 2016. The winnerswill be notified within 48 hours of the giveaway ending. The winners will receive a copy of Little Chicken’s Egg-Cellent Adventure and Beyond Beyond on DVD each. I’m taking the kids to stay with my mum in the Lakes for a few days, hopefully the weather will perk up so that we can have a few nice days out! Hopefully we will have a day up the coast if the weather is ok. No plans made yet though. A quiet one with some chocolate breaks! Easter picnic, whatever the weather and hopefully a few day trips. We will visit mum for afternoon tea, exchange Easter Eggs etc. Working all of the holidays and off to a log cabin later in april. I plan on spending time with family and doing a huge egg hunt! Hopefully get my son of his xbox and venture out! A few days away and lots of Easter eggs. I’m seeing my daughter & grandson, then work at 4pm. I plan to do lots of Easter baking! I love getting stuck in and creative in the kitchen! a day out to the zoo and picnics in the park! We dont have any plans yet! Weather permitting we are going to try and get outdoors as much as possible, of course there will be lots of chocolate eating going on too. What we do will depend on the weather. We are off to Spain, can’t wait! Taking the children up to see their Grandparents whom they haven’t seen since December! lots of arts and crafts days with an Easter theme. I am going to take the kids down to see their grandparents for the Easter weekend and I’m planning to organise an Easter Egg hunt for my kids and their Cousins! Family are all coming over, so i’m baking for 8 and a Easter hunt is always had to give the little ones some excitment.. I love really challenging Easter egg hunts that take ages to complete. It means I can celebrate Easter by drinking coffee and eating cake in a nice warm house while the rest of the family are in the garden (probably in the cold and the rain) trying to find the last of the chocolate bunnies and eggs. Lovely! I have family over ,so will be busy .may go out somewhere as well . Not much – just chilling out as a family! We’ll probably have a big slap up dinner with a few drinks. Lots of long walks and an Easter egg hunt! It depends on the weather, if we can get out then a few walks will be good. If not, then relaxing at home. A couple of days in London with the kids. our girls school isn’t closed around the easter weekend, so we will probably stay at home and have family time. It will be a family catch up for us this Easter. We’re having a few family visits, which should be lots of fun! I have a week off work with the kids and plan to visit the Parents in Law for a few days as well as a couple of day trips. We have our Grandaughter on Good Friday, so she is getting Easter Sunday part one with us. Easter food, egg hunt etc, then with her parents she will get the ‘real’ one on the ‘real’ day too. Spoiled little monkey. An Easter egg hunt and cooking for the family. To visit the inlaws and then my family with my daughter, so looking forward to her playing with her cousins. We’re having a meal with family. Sorting out our garden ready to grow some vegetables. Spend time with my sister who I havent seen since October. We are staying home during Easter but the holiday after Easter we are seeing family. My brother & his family are coming to visit. A family meal on Easter Sunday and an Easter egg hunt! Relaxing at home with the family and eating chocolate! I’ll be spending it with my family as always…no other way to do it! Spending Easter with my family. We will go on an Easter Hunt, eat and take a walk at a nearby park. Enjoy the extra two days off, see friends for lunch on Saturday, have my family round for a meal on Sunday. Looking forward to it all! Nothing much Easter weekend, but we’re away to Devon for a week the following week. Relaxing and spending time with family and friends. I’m working sadly but will be spending Easter Sunday at home with my family with lots of goodies and treats! having a easter egg hunt, going for lots of walks and preparing for sats! We are going to spend most of the Sunday at a local easter event followed by a small egg hunt at home. We are also spending Monday at a family easter party that my aunt is organising.